So it blew close to 30 for my first five days. It was straight out of the east which is the exact direction the gulf side flats in the Mexican Yucatan face. Perhaps my previous post with it’s abundantly confident vibe created a bit of a jinx. The aggressive winds kept me off the flats for a while but I could no longer sit and watch the wavelets on the turquoise tapestry that laid a half cast from our seaside abode. While DIYing to success is indeed a great rush and sense of accomplishment, daily skunkings are not. While drinking beer on the beach is very enjoyable, I prefer to fish hard in the day and do my drinking at night. So as I inched closer to success with a few shots at bones and a nice permit on my “home flats”, I made the decision to pony up some pesos for a guide. Luckily I found a really great walk and wade guide to take me out on the pristine flats of Boca Paila, many of which were perfectly sheltered from the hard and relentless east wind that plagued my efforts thus far. Enter Creig Krier. In my desperate attempts to remedy my lack of catching, I approached a fellow angler loading up rods into his Jeep in Tulum and admitted my struggles. 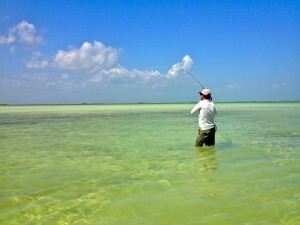 John, from Tulum Fly Fishing, said he was a guide and that he might be able to take me or have his friend Creig take me. That night I firmed things up with Creig, prepared my gear and tried to sleep despite my excitement. I met him at the famous Boca Paila bridge the following morning after a somewhat harrowing drive through the Sian Kaan biosphere reserve in my crumby rental car. 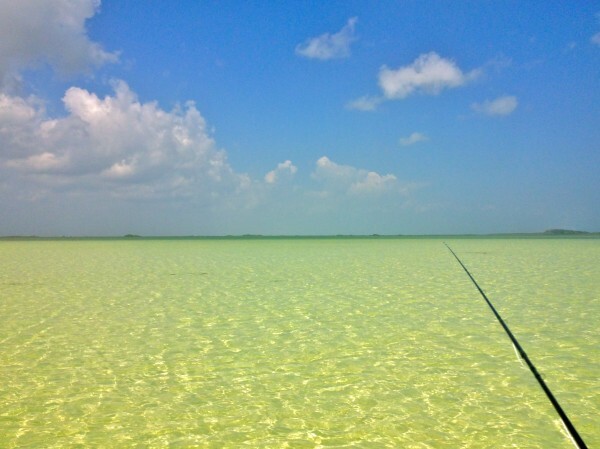 We hopped in his Old Town canoe and proceed to spot bonefish after bonefish for five hours amidst some of the more stunningly beautiful flats I have ever fished. We had shots at permit, ‘cudas, and as many bonefish as you could want. We wade fished all morning, using the canoe to cross channels where we spotted crocs and had a shot or two at nice snook. The great snook fishing they have there this time of year takes place in the surf which was unfortunately not fishable with the east wind. But one of the very appealing things about this area is the many options available to anglers. 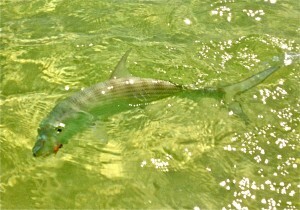 A decent Boca Paila bonefish. Boca Paila, with it’s massive size and huge white flats offers many areas to find lee from the wind. Creig, having fished here for 20+ years knows the fishery really well, like every crevice. We got along great, discussing everything from fanatically chasing the tarpon migration to fanatically chasing the Grateful Dead. Small pink charlies and puffs worked like a charm, as we landed bonefish after bonefish on an extremely rewarding day on the flats. After a few skunkings, those fish felt so good to catch. Likewise, after an amazing day on the water, the beers we shared at Mateo’s on Tulum Beach tasted oh so much better. This part of the world is so great. Phenomenal fishing, beautiful women, cheap and delicious eats, and direct flights from JFK on JetBlue are just a few of the elements that make this such an alluring destination. If you go be sure to contact Creig. He is a superb guide in every sense. You will not be disappointed.